I chose to showcase the Tranquil Textures Designer Series Paper. I used it on the get well card, the envelope flap and the gift bag. This makes for a well coordinated get well gift set. I didn’t even have to think about colors – I pulled them right off the list of colors used in this DSP set – easy peasy. The card starts out with a Fresh Fig card base – 8 1/2″ x 5 1/2″, scored at 4 1/4″. Next up is a 4″ x 5 1/4″ layer of Tranquil Tide CS. I kept the front simple by using a 3 7/8″ x 5 1/8″ layer of the Tranquil Textures DSP. The layers are adhered to the card with snail adhesive. I also used a 2″ x 6″ strip of the DSP to decorate the flap on my Very Vanilla envelope. I just put some snail adhesive onto the flap and put the DSP over that and used my paper snips to trim off the excess. 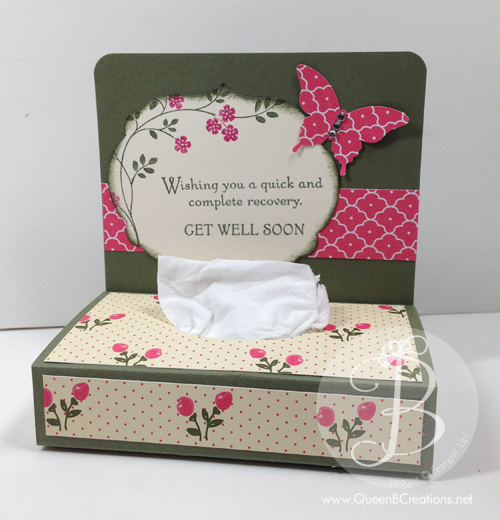 I stamped the sentiment “get well soon” from the Healing Hugs stamp set, in Fresh Fig ink, onto a Very Vanilla oval that was cut out with the Layering Ovals Framelit Dies. The Very Vanilla oval was then layered on a scalloped oval in Tranquil Tide CS. The ovals were then adhered to the card front with snail adhesive. I stamped the flower from the Healing Hugs stamp set in Fresh Fig onto a scrap of Very Vanilla CS. I used the masking technique to add the leaves. It was then fussy cut it out with paper snips. I adhered it to the lower right corner with snail adhesive, allowing it to over lap the oval a bit. I finalized the front with 3 of the gold faceted gems in the upper left for a little bling. Masking Technique: I stamped the flower first, then stamped it again onto a post it not and cut it out. I stuck the post it note over the flower and then stamped the leaves. This makes them appear like the are coming from behind the flower. The inside of the card is lined with a 4″ x 5 1/4″ layer of Very Vanilla CS. Before adhering it into the card, I stamped the flower in Fresh Fig ink, hanging off the edge of the upper left and lower right corners. The sentiment was then stamped in Tranquil Tide ink. This was adhered into the card with snail adhesive. I made this gift bag to match using the same, Tranquil Textures, DSP and the Gift Bag Punch Board. The bag was quick and easy to make using a 6″ x 12″ piece of DSP and following the directions on the front of the punch board. To dress it up a bit I used a 6″ x 1 1/2″ strip of the same design and a 1″ x 6″ strip of another paper from the DSP pack. They were adhered together with snail adhesive and the end was flagged using the Banner Triple Punch. I finished it off with a flower matching the one on the card and a piece of 5/8″ burlap ribbon. I invite you to try making a cute set like this of your own. Links for all the product used is listed below with links to purchase the supplies from my store. Hi Stampers. It’s been COLD! Winter has officially arrived… burr… Cold weather means colds – that means we need Get Well cards! I love it – another reason to stamp! This card started out with a Crumb Cake card base – 8.5″ x 5.5″, scored at 4.25″. Next is a 5.25″ x 4″ layer of Chocolate Chip card stock. The “wood” layer is a piece of Very Vanilla card stock cut at 5″ x 3.75″, stamped with the Stampin’ Up! Hardwood background stamp, stamped in Crumb Cake ink. Stampin’ Tip: The background stamps are very large and can be hard to apply even pressure the normal way. Therefore, I layed the stamp on the table with the image up. I then applied the Crumb Cake ink by patting the Stampin’ pad all over the stamp and then placing the Very Vanilla card stock on top of the stamp, covering with a scrap of copy paper and applying even pressure all over the paper to transfer the ink to the card stock. 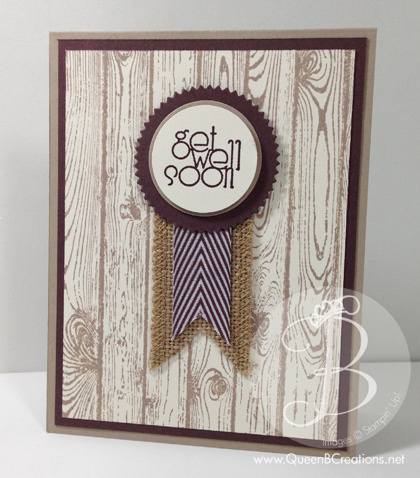 I stamped the “get well soon” from the Delightful Dozen stamp set with Chocolate Chip ink onto Very Vanilla card stock and punched out with the 1 3/8″ circle punch. I then cut a 1 1/2″ circle with the Circle framelits out of Crumb Cake card stock and a slightly larger circle with the Starburst framelits and Chocolate Chip card stock. I adhered the Very Vanilla to the Crumb Cake with snail adhesive, and the Crumb Cake to the Chocolate Chip with dimensionals. Beneath the circles, I have a strip of 1 1/4″ Burlap ribbon and a strip of 3/4″ Chocolate Chip Chevron ribbon. Stampin’ Tip: To get that perfect point in the bottom of the ribbon, I layered them one on top of the other, centering the smaller ribbon in the larger one and and folded to two in half and cut from half an inch up in the center to the edge of the ribbon with very sharp scissors. I have a special pair of Stampin’ Up! Craft Scissors that I only use on ribbon so they stay sharp. I find the ribbon adheres to the other ribbon and the card best with glue dots. Have a great day, my friends! Hi Stampers. As you know, I’ve been working on items to sell at upcoming craft fairs and figured since cold season is upon us, tissue holders may be a good idea. I started out with a piece of Mossy Meadow card stock 4.5″ x 10″. I scored it at .5″, 3″, 4″, 6.5″. To soften it a little I rounded the corners that will be the top with the Stampin’ Up! Project Life corner rounder. I then cut designer series paper (the DSP in the photo is from the Stampin’ Up! All Abloom paper stack) 4.25″ x 2.25″ and 4.25″ x .75″ for the bottom and a strip 4.5″ x 1″ for the top. I used the same DSP to punch out a butterfly with the Stampin’ Up! Elegant Butterfly punch. I then cut a piece of Very Vanilla card stock out with the label framelits (framelit # 3 counting from smallest to largest). I inked up the tree branch with blooms from the Stampin’ Up! Thoughts and Prayers stamp set by coloring onto the stamp with my Mossy Meadow and Melon Mambo markers, huffing on it with my breath (to moisten the ink) and then stamping onto the card stock on the upper left side. I allowed some of the stamp to hang over the edge and stamp onto the scrap paper below. I then stamped the Get Well Soon sentiment from the Thoughts and Prayers stamp set onto the lower right side of the label in Mossy Meadow ink. I finished this off by sponging a little Mossy Meadow ink around the edge of the card stock. It was now time to assemble. I adhered the DSP to the base with snail adhesive first and then used the Stampin’ Up! oval punch to punch out a hole in the center of the top, where the tissue would pop out. I then used a strip of sticky strip to adhere the 1/2 inch side to the back, giving me the slot to insert the tissue packet into. The 1″ strip of DSP and label were then added to the top with snail adhesive. For the butterfly, I used a glue dot in the center of the butterfly, none on the wings. This allows to wings to stick up a little as if the butterfly could float away. I then added a little sparkle by adding a few rhinestones to the middle of the butterfly as his body. Go ahead and pop over to my store and pick up the supplies needed to make a few of these for your friends and family that may catch a cold this year and need a small give to remind them that you are thinking of them. If you have not gotten on board with Project Life by Stampin’ Up! yet, now would be a good time – before we add even more holidays photos to the growing pile in the closet…. LOL click here to add your name to the drawing for some FREE product! Can’t go wrong with FREE, right?!?! You only have a few days left to take advantage of FREE Designer Series Paper when you take the demo kit for a test drive. No obligation – no further obligation to buy ANYTHING! Just enjoy your discount and free shipping! You can’t lose!! For a limited time, you can enjoy six months of FREE Designer Series Paper. Yep, you heard that correctly. You’ll receive one FREE package of Designer Series Paper, every month for the next six months. Please note Designer Series Paper will be offered based on availability. Holiday catalog paper will be unavailable after the catalog ends, at which point occasions catalog paper will be available on January 6, 2015.